This chane ki daal with paneer cubes is one of those favourite recipes that make my life easier, meals tastier and keep my eating resolutions in place. All at once trust me. This chane ki daal is made a little thick like chana masala or chhole and suits a lunch box meal really well. Also, this chane ki daal can be served with a variety of Indian breads and rice preparations, can also be had like a one pot meal. Try that if you trust me. 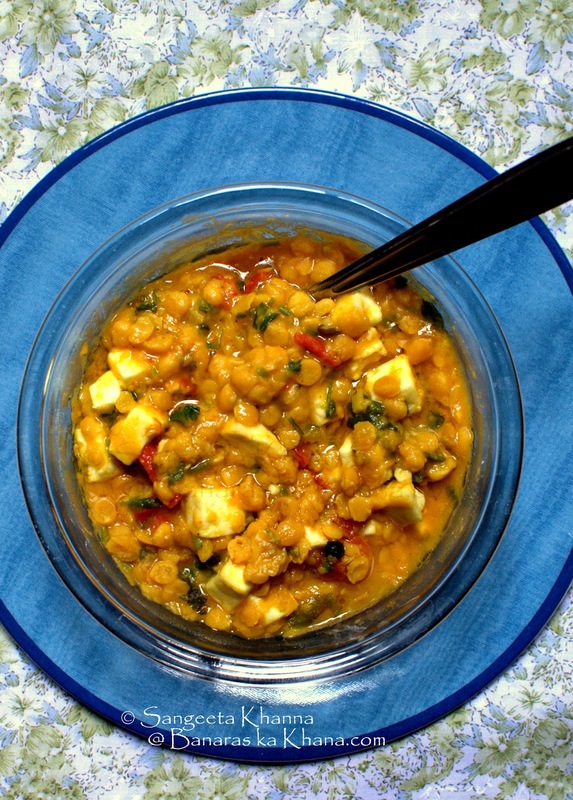 Another chane ki daal masale wali is a UP specialty but this one with paneer is my own take on this healthy lentil. There are some daal recipes in my repertoire that make my cooking really quick and convenient. These daal recipes are tasty as well as really quick to cook, wholesome flavours that can make a quick meal in itself, can be taken into lunch boxes and can be cooked in a hurry when you have unannounced guests. I depend on these recipes a lot and keep playing with the flavorings a bit according to seasons and available herbs and required spice level. These daal recipes basically do not need a tadka or just a quick 'heeng jeere ka tadka' instead of bhunoeing a whole lot of onion, garlic and ginger paste, masala powders and all that jazz. Apart from this chane ki daal paneer wali, there is a Bengali recipe of coconut laced chane ki daal, a few versions of sabut mung ki daal and another sabut masoor ki daal that I make quite often. It is a shame the recipe is still not on the blog but let me tell you that these recipes are mostly cooked in such a hurry that there is no time to click pictures and share them with you all. Hoping to make those daals again this winter and click pictures too. Yes I like these daals as a one pot meal in winter season. Especially for dinner. So this chane ki daal paneer wali is a one step recipe. You just mix the ingredients and pressure cook. The time taken to cook this recipe is just about the time that chane ki daal takes to be pressure cooked and that is about 20 minutes total (for 2-4 servings). Not much chopping, no preparation for tadka and absolutely healthy. to be added after the pressure cooking..
Bring everything together in the first list and pressure cook for 10 minutes after the first whistle. This is the time taken for the lentils to get cooked but not too mushy. The time depends on the quantity you are cooking and the size of the pressure cooker as well, so adjust that according to your requirement. Add the ingredients from the second list to the cooked daal and simmer for 2 minutes. Let it rest for 5 minutes before serving or serve as required. This daal doesn't reheat too well but you can dilute the daal a little if you have to serve leftovers and it becomes better. It is always better to fish out the whole spices before serving. This chane ki daal paneer wali is a great way to ensure a protein rich meal but please don't assume that it doesn't contain any carbs. All lentils have enough carbohydrates for us to keep us going. We like this daal with millet rotis, whole wheat parathas and sometimes with plain boiled rice. You can serve this daal with an elaborate meal along with pooris too as I have seen people enjoying this daal with poori a lot. Isn't this chane ki daal a really versatile recipe? Try adding some chhole masala to it and see how great it tastes with that too. You can add fresh methi (fenugreek) greens to the daal if that is in season or some dill greens if you like the flavours. This chane ki daal tastes good even without any of these herbs but somehow I never make it without a generous handful of aromatic herbs. Do let me know what would you like it with?